We arrived home from Arizona this past Saturday. I promised to bring some of the heat back, but lost most of it at the Oklahoma/Kansas boarder. We saw remnants of snow on the way back, but no snow cover until Kansas City. The most snow I saw along the entire route was right here at home. Another observation was that the wheat went from great-looking to non-emerged, and we saw very few cattle grazing on wheat pasture. We haven’t had a winter like this in a long time. The way it sounds, it’s going to be quite a while before it warms up — which kind of goes under the late Easter/late spring adage. Unless we move the snow off in two or three days, I would imagine that we are going to have a sloppy mess for a while. We have a high-energy day coming this Wednesday, March 6. Cattle traded $2-3 higher last week, mostly $128 standing and $205-206 hanging. Box meat has added some money. Composite box meat as of March 1: 22-day-and-up sales were 1,266 loads, NAFTA exports 77, and overseas exports 905. Solid number for overseas; really poor number for NAFTA. We need to get our trade straightened out with both Canada and Mexico. We need to see if we can hold the cattle futures together this week. The lighter feeder cattle have been selling higher while the heavier weights have been steady to lower. Smaller weights that will be turned out to grass have been mostly steady to better. Everybody I talk to says the performance of the cattle has been mediocre to poor this winter. President Donald Trump pretty much backed off of raising the tariffs on March 1. The talk is that we are supposed to have a deal by the end of March. We have lost a timely period when our big bean sales would have been to China. This time of year pretty much belongs to South America, as far as the beans go. I feel that the lost sales will be hard to make up. The bean market is inflated. We could end up raising a fairly poor bean crop and still not affect the market too much. 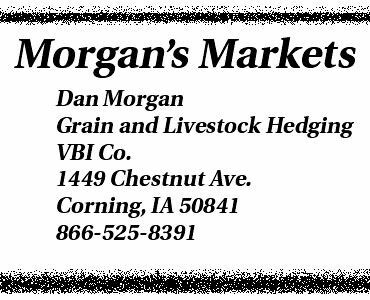 The corn market will probably be the first to respond because of the high number of animals we have on feed and the tightness that could come down the road if we have crop or other unforeseen weather problems. Everybody I talk to has said the cattle haven’t yielded well. Part of this is because of the mud they are carrying, and the other part is probably the poor gains that have been incurred. Every year that is poor for gaining in the winter we have the run up which creates a weather premium. From here on out, the weather premium isn’t going to mean much. breakeven or being sold at a loss. Dunlap fat cattle auction was steady to $1 higher today. Yesterday we traded cattle in the interior at steady money. I think it’s very important that cash cattle trade higher this week and the futures move up. I still think it’s essential for the hogs to hold together for cattle to hold up. I saw a report where 7.5 percent of the dairy herd has been liquidated in the last year in Wisconsin. I would imagine other states to be the same. I think we have finally come into the time where we will see less slaughter cows. We are getting ready to start the rebuilding of the herd in both beef and dairy. A packer bought cattle last week for the third week in March. He either has cattle sitting around him or is buying as the bids permit for him to keep his margin. The cattle crush — which I haven’t talked about in a long time — has moved up sharply from where it was last summer. Thinking back, I think the April crush had a low about $5-7 and we talked about putting the reverse crush on at that time. On Feb. 28 it stood at $109.30. You don’t often get to see the crush pull in that much. We are getting ready to get caught up on some of our reports. The February Cattle on Feed report will be out the 8th of this month, which should catch us up on the reports that were delayed due to the government shut down. This weekly report is for informational purposes only and is not to be construed as an offer to sell or a solicitation to buy the commodities listed herein.